Today i got something special in the mail. 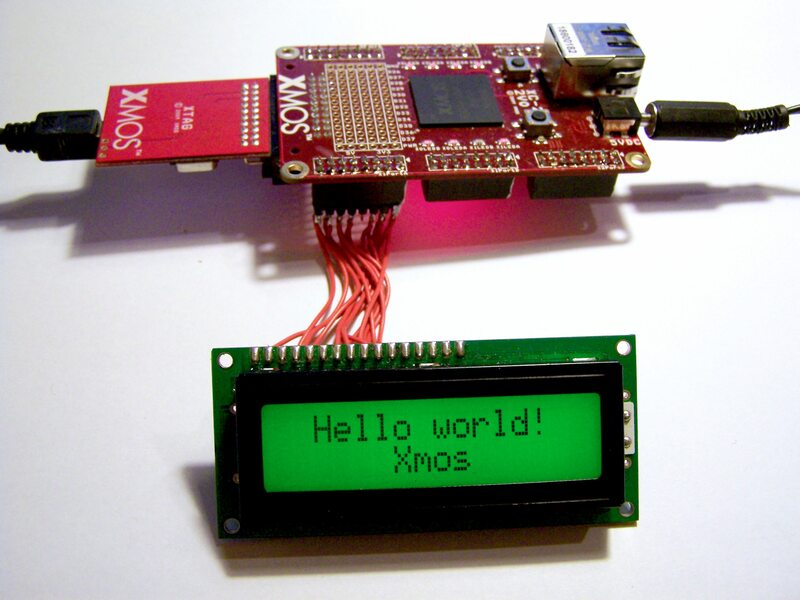 A cute little XK-1 development board and a XTAG2 debuger to go with it. I won this thing on the xcore exchange forums as part of the activity points based giveaway. So what is this board. Its heart is the XS1-L1A chip, that is a single core 400MIPS processor with 8 threads and 64K of memory. Along on the board there are 4 LEDs and 2 pushbuttons that are wired to the I/O pins. There are also two expansion headers that bring out the I/O and power supply. 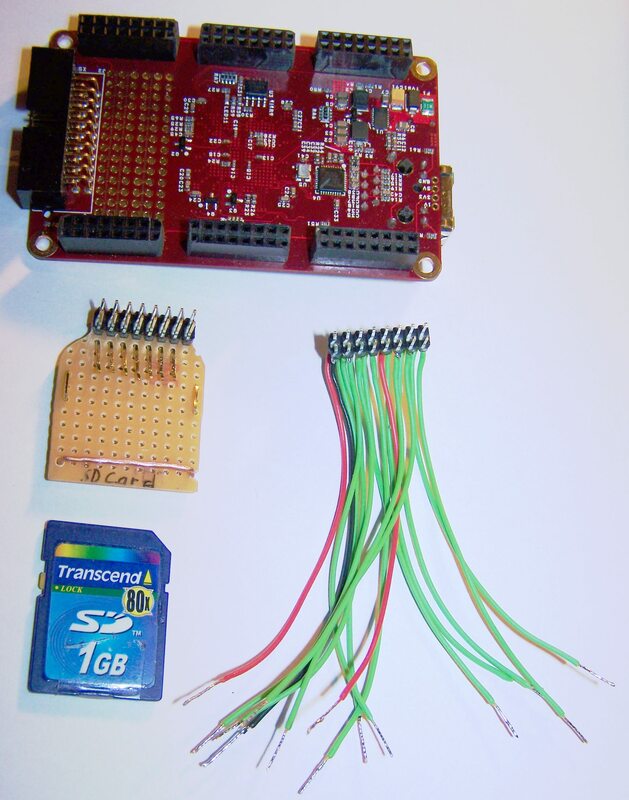 The main feature of the board is the connector on the other side of the programmer. 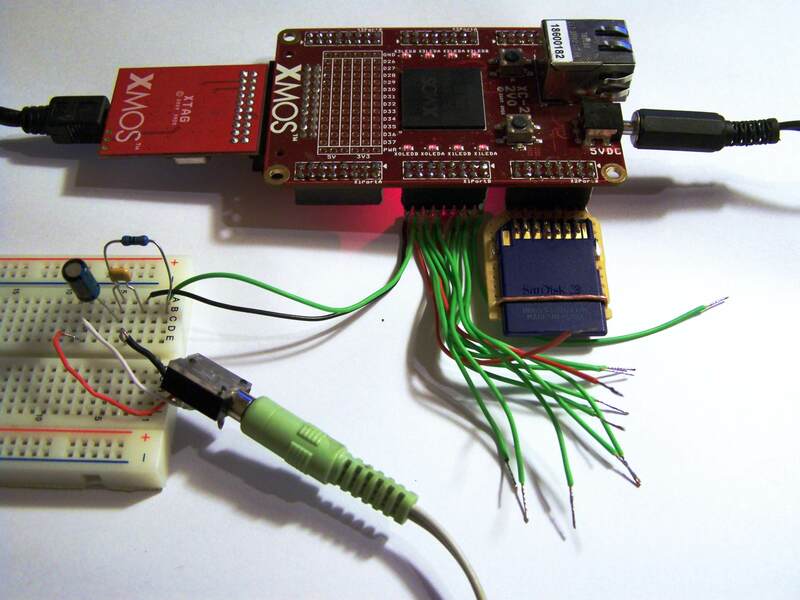 It allows multiple boards to be stacked together to connect over xlinks and share power. This way you can expand the system with ease. Remember that SD Slot i made last time? Well i actually put it to use and interfaced those cards to my XC-2. Okey so how about doing something neat with it? How about playing *.wav audio files from the card. 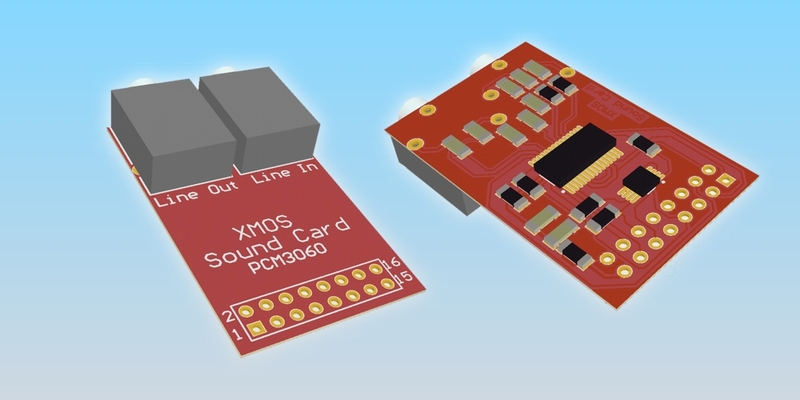 But how do you get a analog audio signal out of a XC-2, well i went for the quickest and simplest way of doing that. 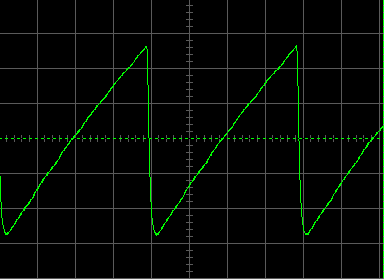 Its PWM going trough a RC low pass filter and out to a audio jack trough a dc blocking cap. Its not really the best DAC in the world but it works quite good actually. So all i needed then is a buffer to keep feeding the PWM generator with data at exactly the right speed to match the wav files sample rate. I went with doing something simple for a start and decided a LCD could be pretty useful, so i made it interface a simple 2X16 character LCD module. Something amazing happened too, the display shown up the text the 1st time i ran my code! Woah! Things tend to never work on the 1st try as there is always something that gets overlooked, but this cute little display must like me. The code still needs a little work to make it easier to use and gota make a channel server/client so i can use it as a nice debug screen.Also need to get in some USART too, so i can have a terminal window (Yeah i love those for debug). So after some time i started a bit on hardware to plug on to the development board. First thing i did was solder some header connectors on to my XC-2 as the board comes with no connectors to allow you to use the connector of your choice. I just used female headers on the bottom of the board. I put then there because i found that the ethernet jack on the top is too tall to allow board stacking with standard headers while there are no problems on the bottom. 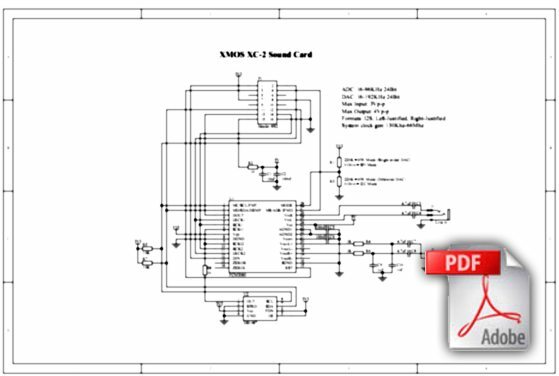 A simple thing i that came to my mind was a SD card interface. Hmm i don’t have a SD card slot to use on it, so the better way of doing things. DIY it! 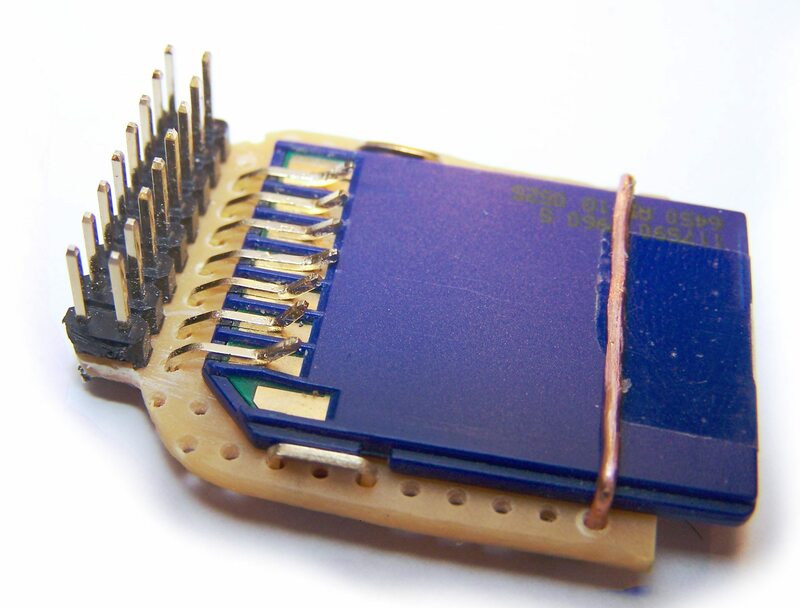 This is a SD card slot built out of a small piece of prefboard and a few header pins and coper wire. 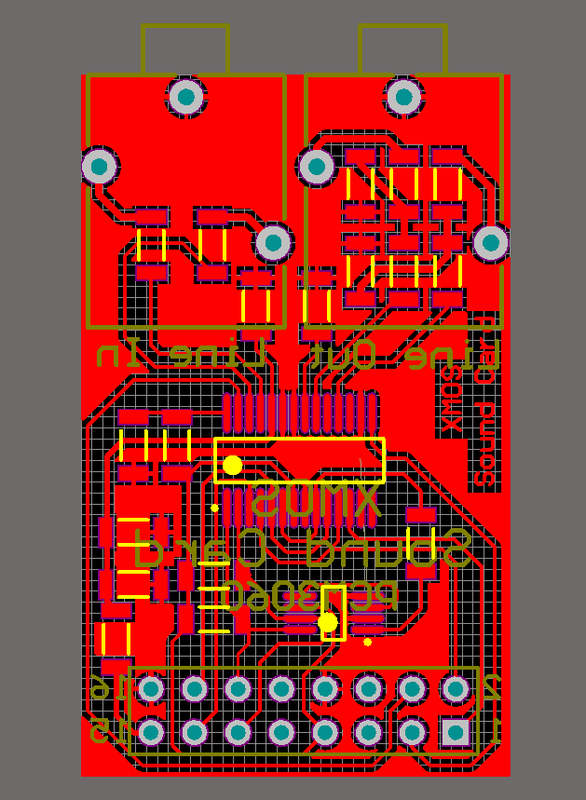 I made one of those before when i needed a SD slot when interfacing a dsPIC to it(it ended up very reliable too).So all i did was make a copy of that one and put a two row header to plug in to the XC-2 board. Next time you need a SD slot fast, just grab a little prefboard and some header pins. The 2nd thing in the photo is the mess of wires that can be used to connect pins of a connector on the XC-2 to a breadboard for quick testing of a piece of hardware on it. It might come very useful to do some quick stuff on it. I didn’t start on the software for this stuff yet tho. I hope to get some done soon. The XMOS Challenge syndicates its weblog posts and Comments using a technology called RSS (Real Simple Syndication). You can use a service like Bloglines to get notified when there are new posts to this weblog.